On Monday, October 10, 2016, Illiana’s Association overwhelming voted to approve the following recommendation from the Board of Directors to proceed with construction of the new campus. On March 24, 2014 the Association overwhelmingly approved the construction of a new campus in Northwest Indiana. 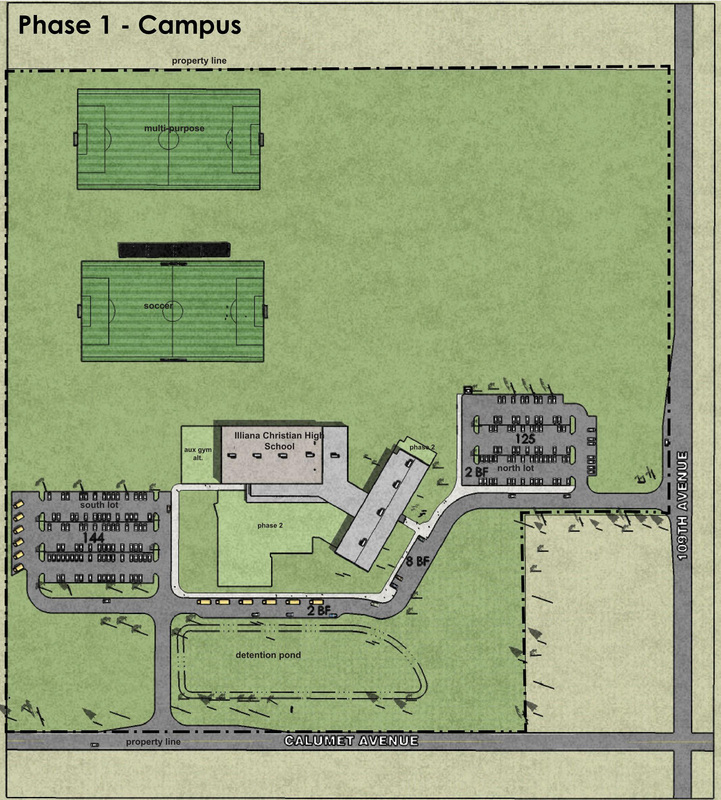 With that approval, the Board has accomplished a great deal of work and has finalized the design of the new campus based on the current and future needs of the school, as outlined in previous gatherings and communications to the Illiana community. The Board now has construction cost estimates based on the specific architectural designs. At the same time, the Capital Campaign Committee has seen God’s provision of approximately $20 million in cash and pledges towards the building program. 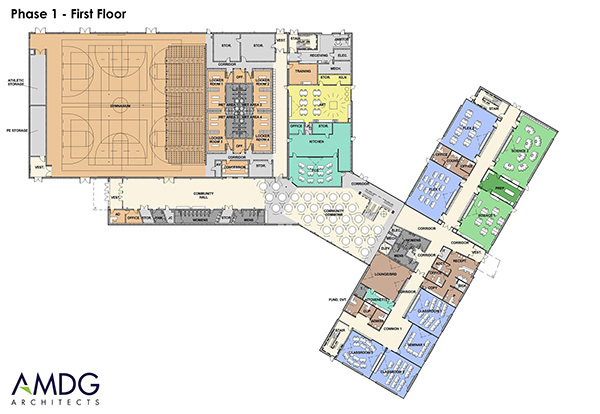 We also now have a much deeper understanding of our capacity as a community to support the building program, and we see that starting with a well-financed first phase will lead us into the commitments needed to complete the originally envisioned campus. It is with this new clarity and more informed confidence that the Board of Directors is recommending the Association approve proceeding with construction based on a phased construction process, and based on the terms described in the recommendation. This phased approach will allow the Board to start the project and build the main portion of the campus with a target to relocate by the fall of 2018. 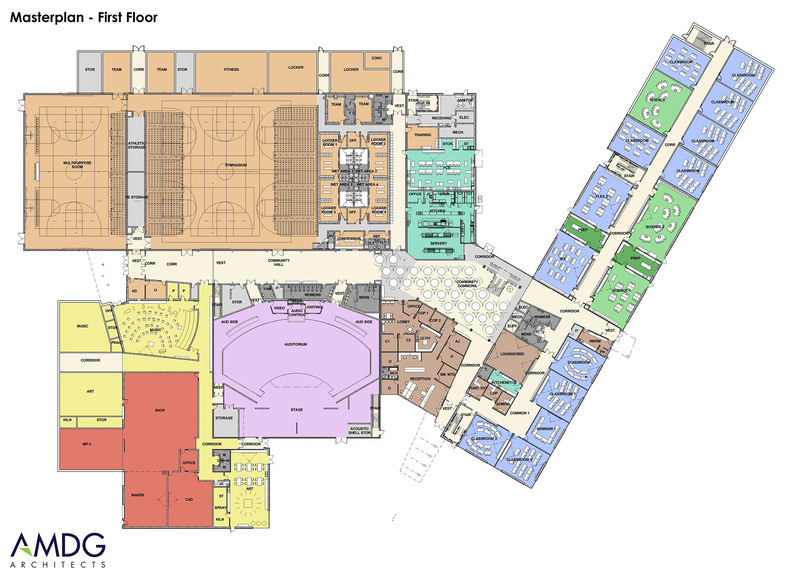 The Capital Campaign will continue their efforts to raise the remaining funds until the full campus design is realized. 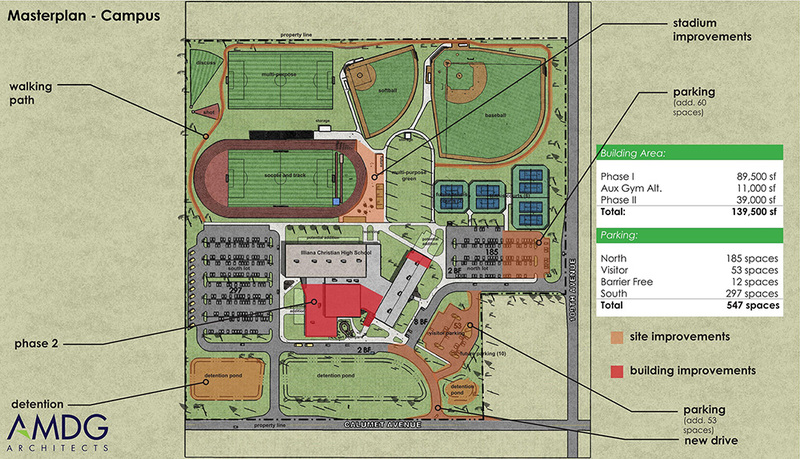 The Board has prepared schematics showing the full campus design. 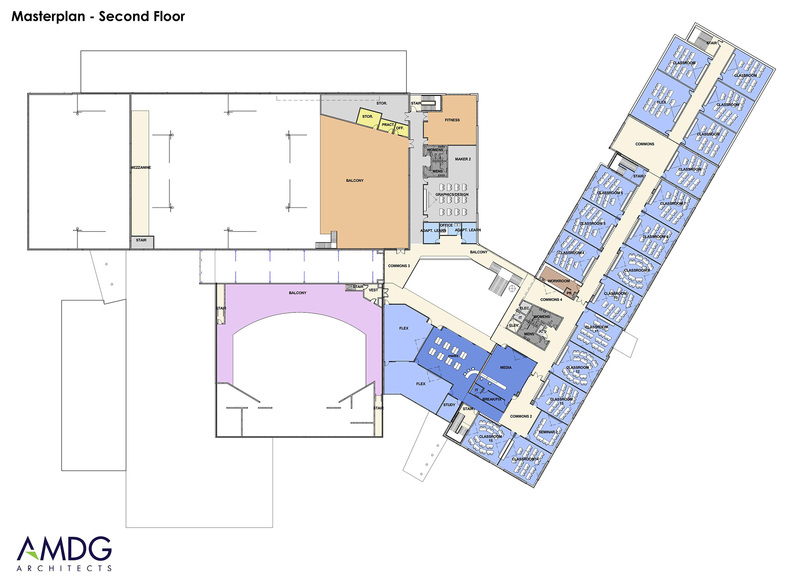 Phase 1 will allow the school to relocate with minimal impact to the existing programs to the new campus. The cost estimate of Phase 1 is $25 million. The remaining phases have been designed so that they can be selected by the Board and proceed with any number of options based on the funding raised or construction cost savings realized. The final construction cost has been estimated at $39 to $40 million. The Board has continually sought God’s guidance through this process. These new terms are different than the recommendation approved in 2014. However, the Board is confident this is the process we have been led to over the last two years. We remain committed to a minimal impact on tuition of the current and future Illiana families. The Board has been able to identify willing lenders and loan options for a long term loan for up to $5 million. Based on current estimates, the impact to tuition is estimated to be approximately $60 per month per student. We are also recommending that the additional phases continue only as funds are available without exceeding the $5 million long term loan. The Board of Directors appreciates all the prayers offered during this process. We believe that God has guided us to this point and are thankful for the generosity He has shown through His people. Please continue to pray for the Board as we move to this next step, continually seeking God’s guidance and blessing on the work of Illiana. 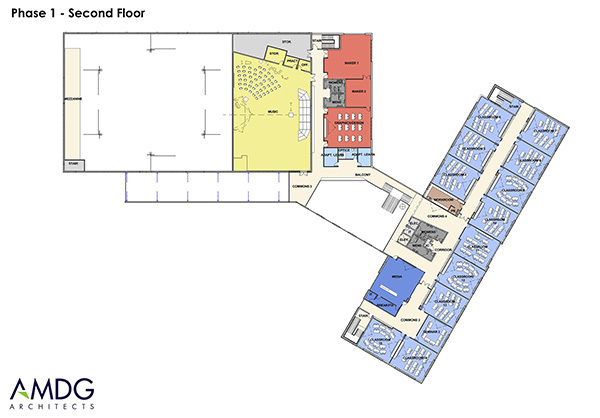 We remain committed to our original 2014 campus plan and view this recommendation as a means to achieve that plan. Phase 1 is estimated to cost $25 million. We have secured donations and pledges of approximately $20 million. We will arrange for long-term financing of up to $5 million to be paid out of the annual operating budget. Short-term construction financing will be arranged to bridge donor income and construction costs. Construction for the remainder of the campus will occur as funds (cash, pledges and gifts in kind) become available without additional long-term debt. This proposal supersedes the 2014 recommendation previously approved by the Association. Click here to view our frequently asked questions regarding this recommendation.